Comments: Almost entirely restricted to North America, Forster’s Terns spend their entire lives from the central Canadian Prairie Provinces south to Panama. A marsh specialist, Forster’s Terns build nests on muskrat houses, vegetation mats and low islands. They are rarely found on sandy beaches or rocky islands. They nest colonially, often in association with other waterbird species. They are most likely confused with Common Terns. 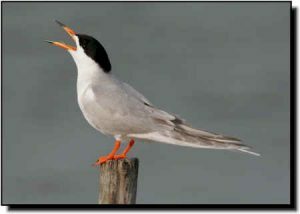 Look for the Forster’s Terns’ longer, orange-red legs and longer, thicker, orange-yellow bill with a black-tip in the breeding season or all-black bill in the winter. At rest, breeding adults have outer tail feathers that project well beyond their wing tips. Their pale gray forked tails show white outer edges and their wings are frosty white with lighter wingtips year-round. Immatures and nonbreeding adults show a dark eye mask and a pale nape.